How Far Along Is My Pregnant Sugar Glider? Native to Australia and New Guinea, sugar gliders were introduced to the United States as exotic pets not long before the turn of the millennium. In the wild, sugar gliders breed seasonally, but in captivity they breed year-round. These small marsupials have reproductive systems and cycles different from those of other mammals. Nevertheless, they are fairly easy to breed in captivity. The United States Department of Agriculture may require a license to breed and sell sugar gliders. Sugar glider females reach sexual maturity as early as 8 months of age. Males are able to reproduce starting around 12 to 15 months old. Females go into heat every 29 days. Like other marsupials, sugar gliders have short pregnancy periods; the female will give birth within 15 to 17 days of conception. Knowledge and control over the mating process gives owners a general idea of when a glider will give birth. Without knowing exactly when the mated, you're only able to guess. Sugar gliders typically give birth to one or two joeys. Because of the short gestation period, it's essentially impossible to be sure a female sugar glider is pregnant until after she has given birth. Once that's done, you'll know how far along she is: She's done. At the end of the short gestation period, the fetus migrates to the mother’s pouch following a trail of saliva the mother has made. The joey will grow in the pouch for approximately one month before the peanut-sized outline of his form is externally visible. Most of a joey's development takes place in the mother's pouch, in which are four teats. Each produces different milk for the joey depending on the baby's stage of development. Although you can handle your female sugar glider throughout pregnancy and marsupium stage, you have to take care around her pouch. Peaking inside the pouch could knock the joey off a teat, causing it to die. Joeys begin to foray out of mother’s pouch at around 9 weeks of age. About a week later, thin hair will begin to cover the joey’s body; within 10 days the joey’s eyes will fully open. After the joey has been out of pouch for around five weeks, it will start to eat the same food as its parents. In another three weeks the joey will be fully weaned. 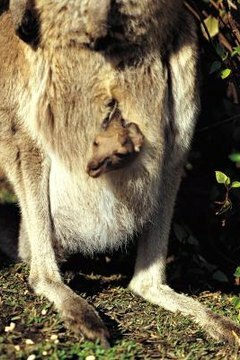 Once the joey has left his mother’s pouch, you can handle him without fear his parents will reject him. The USDA requires licensing for commercial sugar glider breeders under the Animal Welfare Act. The act contains an exemption from licensing requirements for hobby breeders who have fewer than three breeding females, sell offspring directly to private pet owners and do not have more than $500 in gross income from these sales. All of these conditions must be met for the exemption to apply.